XOAR Carbon Fiber Precision Pairs with Aluminum Self Tightening Adapters, the perfect enhancement for your DJI Inspire 2 for every professional applications such as Aerial Cinematography, Security, Agriculture, Survey & Mapping, Research & Rescue, Traffic Monitoring & more. 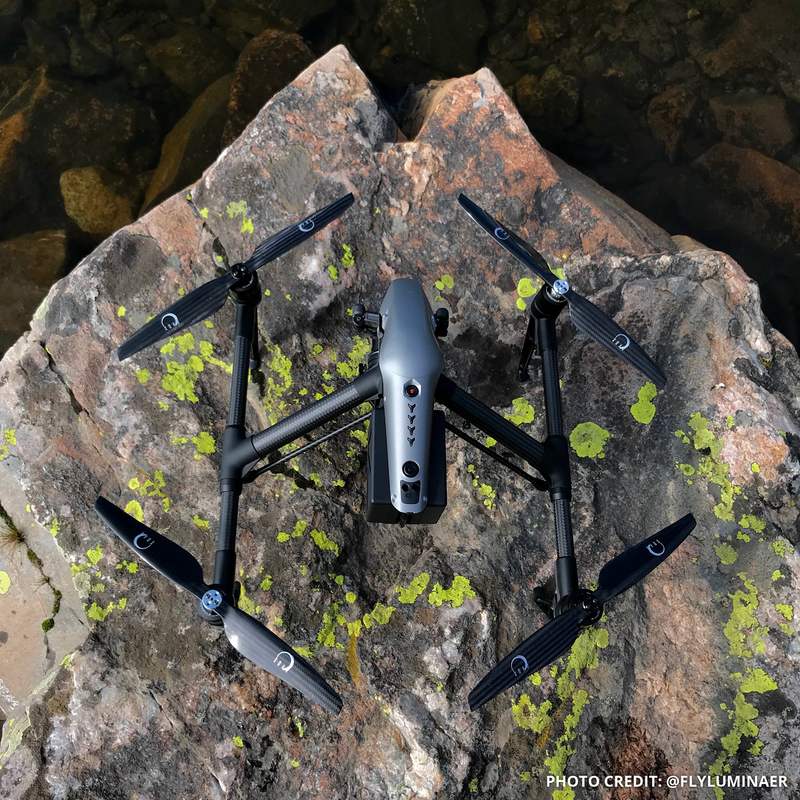 Specially designed and created for DJI Inspire 2. 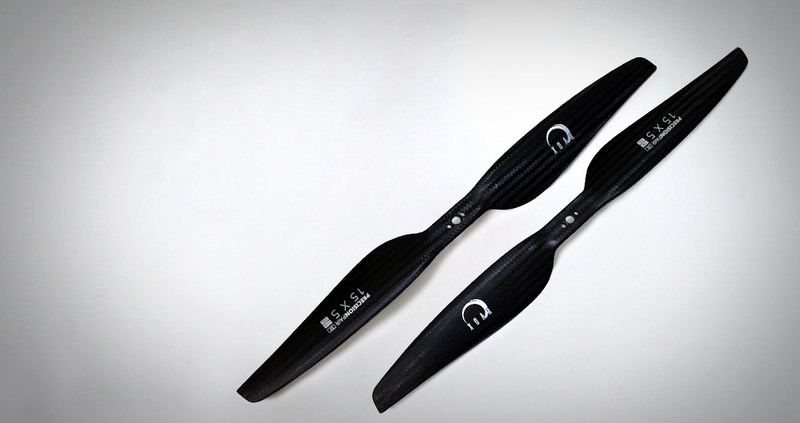 These CF props are made of premium Carbon Fiber fabric and special resin system that offer ultra light weight to maximize efficiency and torque for Aerial Applications. XOAR PJP-T-L Carbon Fiber Precision Pair Quadcopter Propellers are designed and engineered with unique blade shape and thin hub. The pairs have the same pitch and same weight for accurate, responsive and stable performance. The maximum tolerance of weight difference for each pair is 0.5 gram; this guarantees consistent performance - same torque is produced by the motors on each pair of opposite arms - for your DJI Inspire 2. The self tightening adapters are made with high quality aluminum. Tested for holding the props securely. The adapters come with 2 sets of side holes - 12mm and 13mm between the center of the 2 side holes. These Xoar Props can be mounted on Xoar Self-tightening adapters using the 13mm mounting side holes or directly on DJI Inspire 2's motors after removing DJI's adapters. 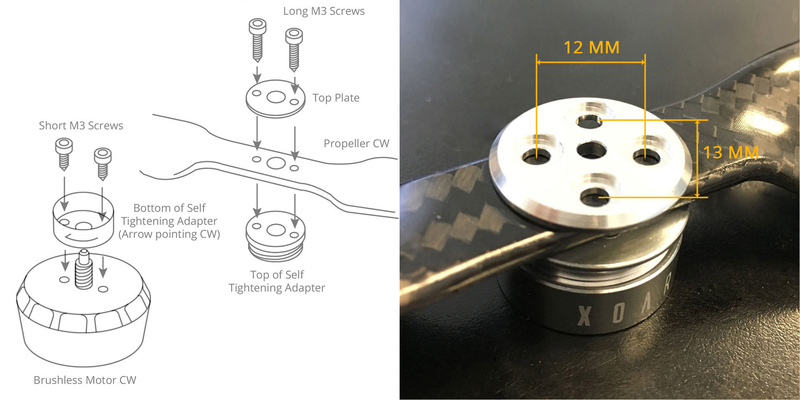 Please use the 13mm sets for mounting these Xoar props on the top part of self tightening adapters; when installing the bottom part on DJI Inspire 2's motors, please use the 13mm set. These props can NOT be mounted directly on Inspire's motors. XOAR's Carbon Fiber Quadcopter Propeller for DJI Inspire 2 are constructed to offer maximum strength and endurance by it's unique structural design. 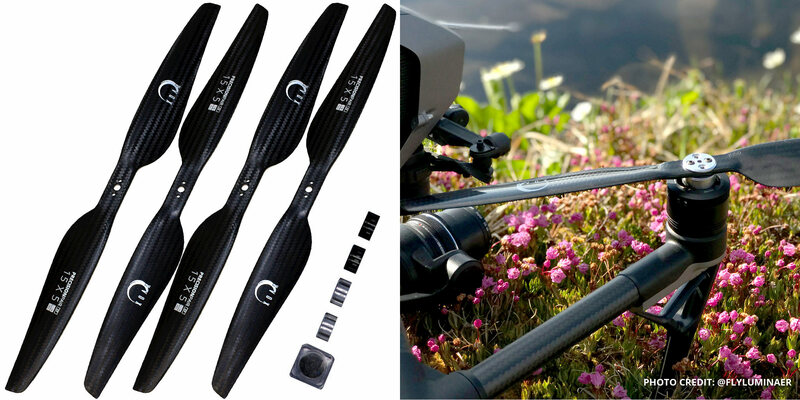 The superior strength reduces flexing of the tips in Drone flight which greatly lower noise and vibration to yield a stable, responsive, smooth, accurate and quieter flight compare to the stock DJI Props. Please note: Performance data below was collected from a closed lab environment. Actual data varies base on external environmental factors and motor efficiency. These XOAR Props can be mounted on DJI Inspire 2 using XOAR Self-Tightening adapters or directly on DJI Inspire 2's motors. First, please remove DJI Inspire 2's original adapters. Self-Tightening adapters are compatible with motors with mounting holes distance of 12mm and 13mm. The arrow on the self tightening adapter should be pointing to the direction of propeller rotation. Short screws are used to connect the bottom part of the self tightening adapter to the brushless motor using 13mm set of side holes. Longer screws are used to mount the propellers to the top part of the self tightening adapters using the 13mm set of side holes. 1 x Hex L-wrench for M3 screws. *Before each flight, the bolt tightness needs to be checked, sheer strength create by loose bolt could result into prop hub failure.